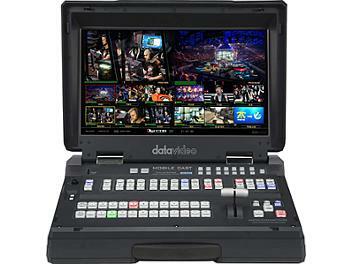 HS-3200 is a 12 channel professional mobile hand carry switcher with real Full 1080p/60 (3G) High Definition support, it features easy-to-use video streaming and recording appliance for professional video producers who need to simultaneously stream a live event and record the master quality version for post-event editing. With 12 digital inputs including 8 SDI and 4 HDMI inputs with embedded audio, 5 SDI and 4 HDMI outputs for connecting HD recorder, monitor, etc. HS-3200 is a lightweight, portable and powerful featured mobile studio solution which is designed for live events and TV programs that need to mix a variety of video and audio sources. HS-3200 is also a great value solution for the worship, education and AV market. The HS-3200 also has powerful, easy to use effects, including Chroma / Luma Key, DSK, PIP, DVE, Wipe Generator, Still stores, logo insertion. Advanced features include a 17.3-inch Full HD 1080p video monitor, which displays the multi-view, the Multi-view includes all the input sources, as well as preview and program.